Logstash is very flexible and rich powerful engine used in every organization, but to unlock its powers you have to MASTER IT. Testing Logstash real configuration input, output, codecs and filters is a extremely tedious process results in logstash configurations that are not tested properly and it break very often. To master it, you need a predictable testing configuration. 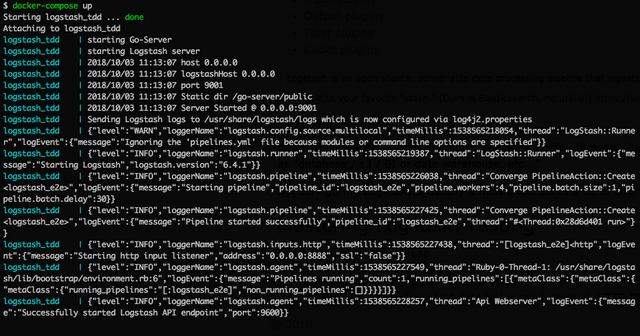 GO + Socket.IO + NG + Logstash FTW! In this post i will demonstrate how to achieve e2e testing for Logstash server configuration. Logstash is used in almost every tech team with main users as devops or sysadmins, but hey do you know that we use Logstash in so many other ways? like: application log shipping, different server logs, ingest and transform data then output it to any destination such as "database / s3 / BI or data warehouse, etc..."
But configuring Logstash is usually a hassle and takes a lot of effort and based on trial an error! HTTP Input to send our test data to Logstash through HTTP "Receives events over HTTP or HTTPS"
Stdout to output the transformed data so we are able to determine the testing result "Visually"